A water resistant lash enhancing black mascara with a conditioning complex to give you long voluminous lashes all day, through rain, sweat and tears. 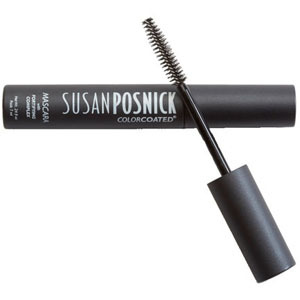 Susan Posnick Colorcoated Mascara Black has a unique twisting brush works to separate and thicken the lashes with one easy twirl for beautiful thick lashes. Twist the brush inside the container to deposit mascara onto the brush. Never pump the wand, as this adds air to the mascara container, which will only make your mascara dry out faster. Hold mascara brush as close as possible to base of lashes, and twirl it as you move it up through lashes, separating and lengthening your lashes at the same time. Use less mascara on lower lashes than on top lashes. As this mascara is water resistant use makeup remover or an oil based cleaner for best results.